Over the years on one of the color management discussion lists it has been postulated that simpler colorimeter devices work better for calibrating and profiling monitors. This is because some people seem to get better results with the colorimeter than with a spectrometer such as the Eye-One. One possible reason for this difference may be the type of sensor used in the spectrometers. Most use a CCD or photodiode array, which is a series of sensor elements arranged in a linear configuration, with a diffraction grating and optics to split the incoming light into the spectrum, focusing it on the array. The colorimeter devices are usually three or four individual sensors with filters over three of the sensors that approximate the XYZ tristimulus functions of the human eye. In four sensor devices the fourth sensor is usually a luminance sensor. These sensors are often arranged in a triangle or a square configuration. The interesting thing about LCD panels are that they use polarizers to create the image. There is a one to initially polarize the light from the backlight, then the liquid crystal layer, then another polarizer in front, set to a 90 angle from the first polarizer. When a voltage is applied to a liquid crystal element, the crystals line up, letting light pass through the liquid crystal layer or get blocked, depending on the panel design, there are many types of LCD technologies which I will not go into here, but most of them work in this manner. Since the last optical element the light passes through, disregarding any cover glass or other coverings, is a polarizer, the light coming from the panel is polarized. This is where it gets interesting. When a spectrometer with a linear sensor is positioned on the LCD panel, it will be sensitive to its alignment with the angle of the polarized light coming from the panel. If these assumptions are correct, then it might help explain why the spectrometer sometimes gives lower quality results with LCD panels. When the sensor is in alignment with the polarization angle the light intensity should be higher than when it is rotated 90 degrees from the polarization angle. A quick test of two LCD panels, one from a PowerBook G4 and the other from an iMac were checked with a polarizing filter. 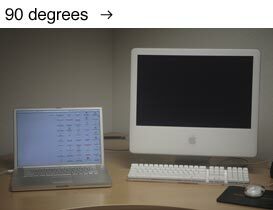 As can be seen in the images below, the PowerBook has a 45 degree extinction angle and the iMac has a 90 degree extinction angle. 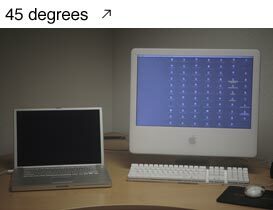 If a spectrometer is used to calibrate these two monitors to each other, the differences in polarization angle might result in the software believing the screens are calibrated properly yet the two screens might not match. The exposure for each image was identical, yet the brightness of each LCD changes with the polarization angle, just as a linear sensor in the spectrometer might react to the different monitor polarization angles. To test this theory a white patch was created in Illustrator and presented on an LCD panel with a set of angled lines to aid in aligning the spectrometer. The panel is placed horizontally so the angle can be more easily set. An Eye-One spectrometer, Rev. B, was used to measure this patch at different angles of rotation from 0 to 180 degrees, starting with the Eye-One aligned vertically to the panel as shown below. All measurements were referenced to the starting meaurement. The intensity of the measurements vary by almost 7% over the 90 degree rotation. The slight increase in brightness at 20 degrees is due to the spectrometer sensor lining up with the monitor's polarization angle. The Eye-One from X-Rite is the most widely used spectrometer on the market today. It comes with a nice accessory kit for adapting the instrument to a variety of measurement situations. 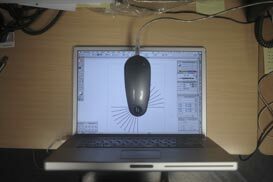 One of these attachments is designed to allow the Eye-One to measure LCD monitors. This attachment allows the LCD panel to be measured with the Eye-One positioned flush to the panel surface. A counter-balance weight keeps the Eye-One in position. Part of this LCD attachment also blocks room light from directly effecting the measurement. Another attachment, an ambient filter, is used to make measurements of viewing booth lighting. The ambient filter, when placed on the Eye-One, will randomize the incoming light, removing the polarization applied by the LCD panel. This is the good news. Unfortunately, when the filter is on the spectrometer, the Eye-One cannot be attached to the LCD measurement attachment. This is the bad news. So, to use the Eye-One with its ambient filter to measure the LCD panel, the panel must be positioned horizontally. To keep ambient light from effecting the measurement, a photographic dark cloth was used to cover the panel and spectrometer. Although the measurements with the ambient filter installed were much more consistent than without, there is less uniformity than expected. The rise in the value may be caused by a problem with the measuring setup. A more exacting method will be tried and these results will be updated soon. This method will allow you to get more consistent measurements with a spectrometer regardless of the LCD panel's polarization angle. However, this method is not for the faint of heart. Depending on your spectrometer it is possible to damage the LCD panel during this process. The spectrometer must be light enough not to cause local heating on the display from the spectrometer pressing on the panel. There is also the problem of getting the LCD panel horizontal for the measurements. The USB cord attaches to the Eye-One at the end, protruding out far enough to make it difficult to align the spectrometer in the same orientation as it would be using the LCD attachment.